Tzimtzum (Hebrew צמצום ṣimṣūm “contraction” or “constriction”) is a term used in the Lurianic Kabbalah teaching of Isaac Luria, explaining his concept that God began the process of creation by “contracting” his infinite light in order to allow for a “conceptual space” in which a finite and seemingly independent world could exist. This contraction, forming an “empty space” (חלל הפנוי) in which creation could begin, is known as the Tzimtzum. Because the Tzimtzum results in the conceptual “space” in which the physical universe and free will can exist, God is often referred to as “Ha-Makom” (המקום lit. “the place”, “the omnipresent”) in Rabbinic literature. Relatedly, olam—the Hebrew word for “world” or universe—is derived from the root word עלם meaning “concealment”. This etymology is complementary with the concept of Tzimtzum, in that thephysical universe conceals the spiritual nature of creation. Isaac Luria introduced three central themes into kabbalistic thought, Tzimtzum, Shevirat HaKelim (the shattering of the vessels), and Tikkun (repair). These three are a group of interrelated, and continuing, processes. Tzimzum describes the first step in the process by which God began the process of creation by withdrawing his own essence from an area, creating an area in which creation could begin. Shevirat HaKelim describes how, after the Tzimtzum, God created the vessels (HaKelim) in the empty space, and how when God began to pour his Light into the vessels they were not strong enough to hold the power of God’s Light and shattered (Shevirat). The third step, Tikkun, is the process of gathering together, and raising, the sparks of God’s Light that were carried down with the shards of the shattered vessels. Since Tzimtzum is connected to the concept of exile, and Tikkun is connected to the need to repair the problems of the world of human existence, Luria unites the cosmology of Kabbalah with the practice of Jewish ethics, and makes ethics and traditional Jewish religious observance the means by which God allows humans to complete and perfect the material world through living the precepts of a traditional Jewish life. A commonly held  understanding in Kabbalah is that the concept of Tzimtzum contains a built-in paradox, requiring that God be simultaneously transcendent and immanent. On the one hand, if the “Infinite” did not restrict itself, then nothing could exist—everything would be overwhelmed by God’s totality. Thus existence requires God’s transcendence, as above. On the other hand, God continuously maintains the existence of, and is thus not absent from, the created universe. “The Divine life-force which brings all creatures into existence must constantly be present within them… were this life-force to forsake any created being for even one brief moment, it would revert to a state of utter nothingness, as before the creation…” . This understanding is supported by various biblical teachings: “You have made the heaven… the earth and all that is on it… and You give life to them all” (Nehemiah 9:6); “All the earth is filled with God’s Glory” (Numbers 14:21); “God’s Glory fills the world” (Isaiah 6:3). Creation therefore requires God’s immanence. This paradox is strengthened by reference to the closely related doctrine of divine simplicity, which holds that God is absolutely simple, containing no element of form or structure whatsoever. This gives rise to two difficulties. Firstly, according to this doctrine, it is impossible for God to shrink or expand (physically or metaphorically)—an obvious contradiction to the above. Secondly, according to this doctrine, if God’s creative will is present, then He must be present in total—whereas the Tzimtzum, on the other hand, results in, and requires, a “partial Presence” as above. The paradox has an additional aspect, in that the Tzimtzum results in a perception of the world being imperfect despite God’s omniperfect Presence being everywhere. As a result, some Kabbalists saw the Tzimtzum as a cosmic illusion. In Chabad Hassidism, on the other hand, the concept of Tzimtzum is understood as not meant to be interpreted literally, but rather to refer to the manner in which God impresses His presence upon the consciousness of finite reality : thus tzimtzum is not only seen as being a real process but is also seen as a doctrine that every person is able, and indeed required, to understand and meditate upon. In the Chabad view, the function of the Tzimtzum was “to conceal from created beings the activating force within them, enabling them to exist as tangible entities, instead of being utterly nullified within their source” . The tzimtzum produced the required “vacated space” (chalal panui חלל פנוי, chalal חלל), devoid of direct awareness of God’s presence. In order to communicate, a person must put aside all that he knows, all his experiences, and all that he is, and say only one thing (“the contraction”). This is especially the case when we speak of an educator, whose level of mind and understanding is almost completely removed and incomparable to his student, that has to “find” an idea that is simple enough to convey to the student. However, when he goes through this process and now is choosing to express himself through this particular utterance, he has not in any way lost or forgotten all the knowledge of who he really is (“thus the contraction is not a literal contraction”). So too, God chose to express Himself through this world with all of its limitations. However, this does not mean, as pantheism posits, that God is limited to this particular form, or that God has “forgotten” all He can do. He still “remembers what He really is”, meaning that He remains always in His infinite essence, but is choosing to reveal only this particular aspect of Himself. The act of Tzimtzum is thus how God “puts aside” His infinite light, and allows for an “empty space”, void of any indication of the Divine Presence. He then can reveal a limited finite aspect of his light (namely our imperfect, finite reality). The Gaon held that tzimtzum was not literal, however, the “upper unity”, the fact that the universe is only illusory, and that tzimtzum was only figurative, was not perceptible, or even really understandable, to those not fully initiated in the mysteries of Kabbalah. The Leshem articulates this view clearly (and claims that not only is it the opinion of the Vilna Gaon, but also is the straightforward and simple reading of Luria and is the only true understanding). However, the Gaon and the Leshem held that tzimtzum only took place in God’s Will (Ratzon), but that it is impossible to say anything at all about God Himself (Atzmut). Thus, they did not actually believe in a literal Tzimtzum in God’s Essence. Luria’s Etz Chaim itself, however, in the First Shaar, is ambivalent: in one place it speaks of a literal tzimtzum in God’s Essence and Self, then it changes a few lines later to a tzimtzum in the Divine Light (an emanated, hence created and not part of God’s Self, energy). An Israeli professor, Mordechai Rotenberg, believes the Kabbalistic–Hasidic tzimtzum paradigm has significant implications for clinical therapy. According to this paradigm, God’s “self-contraction” to vacate space for the world serves as a model for human behavior and interaction. The tzimtzum model promotes a unique community-centric approach which contrasts starkly with the language of Western psychology. ^ Rabbi Moshe Miller, The Great Constriction, kabbalaonline.org. Shaar HaYichud – The Gate of Unity, Dovber Schneuri — a detailed explanation of the concept of Tzimtzum. This article is about the food or drink of the gods. For other uses, see Ambrosia (disambiguation). In ancient Greek mythology, ambrosia (Greek: ἀμβροσία) is sometimes the food, sometimes the drink, of the Greek gods (or demigods), often depicted as conferring ageless immortality upon whoever consumes it. It was brought to the gods inOlympus by doves, so it may have been thought of in the Homeric tradition as a kind of divine exhalation of the Earth. For its Indian equivalent, see Amrita. Ambrosia is very closely related to the gods’ other form of sustenance, nectar. The two terms may not have originally been distinguished; though in Homer‘s poems nectar is usually the drink and ambrosia the food of the gods; it was with ambrosia Hera “cleansed all defilement from her lovely flesh”, and with ambrosia Athena prepared Penelope in her sleep, so that when she appeared for the final time before her suitors, the effect of the years had been stripped away and they were inflamed with passion at the sight of her. On the other hand, in Alcman, nectar is the food, and in Sappho and Anaxandrides, ambrosia is the drink. When a character in Aristophanes‘ Knights says, “I dreamed the goddess poured ambrosia over your head— out of a ladle”, the homely and realistic ladle brings the ineffable moment to ground with a thump. The consumption of ambrosia was typically reserved for divine beings. Upon his assumption into immortality on Olympus, Heracles is given ambrosia by Athena, while the hero Tydeus is denied the same thing when the goddess discovers him eating human brains. In one version of the myth of Tantalus, part of Tantalus’ crime is that after tasting ambrosia himself, he attempts to steal some away to give to other mortals. Those who consume ambrosia typically had not blood in their veins, butichor. Both nectar and ambrosia are fragrant, and may be used as perfume: in the Odyssey Menelaus and his men are disguised as seals in untanned seal skins, “and the deadly smell of the seal skins vexed us sore; but the goddess saved us; she brought ambrosia and put it under our nostrils.” Homer speaks of ambrosial raiment, ambrosial locks of hair, even the gods’ ambrosial sandals. Among later writers, ambrosia has been so often used with generic meanings of “delightful liquid” that such late writers as Athenaeus, Paulus and Dioscurides employ it as a technical terms in contexts of cookery, medicine, and botany. Additionally, some modern ethnomycologists, such as Danny Staples, identify ambrosia with the untameable hallucinogenic mushroom Amanita muscaria: “it was the food of the gods, their ambrosia, and nectar was the pressed sap of its juices”, Staples asserts. W. H. Roscher thinks that both nectar and ambrosia were kinds of honey, in which case their power of conferring immortality would be due to the supposed healing and cleansing power of honey, which is in fact anti-septic, and because fermented honey (mead) preceded wine as an entheogen in the Aegean world: on some Minoan seals goddesses had bee faces: compare Merope and Melissa. Propolis, a hive product also known for its sweet fruity taste, cures sore throats, and there are many modern proprietary medicines which use honey as an ingredient. The concept of an immortality drink is attested in at least two Indo-European areas: Greek and Sanskrit. The Greek ἀμβροσία (ambrosia) is semantically linked to the Sanskrit अमृत (amrita) as both words denote a drink that gods use to achieve immortality. The two words may be derived from the same Indo-European form *ṇ-mṛ-to- : immortal (n- : negative prefix equivalent to the prefix a- in both Greek and Sanskrit; mṛ : zero grade of *mer- : to die; and -to- : adjectival suffix). However, the connection that has derived ambrosia from the Greek prefix a- (“not”) and the word brotos (“mortal”), hence the food or drink of the immortals, has been found merely coincidental by some modern linguists. 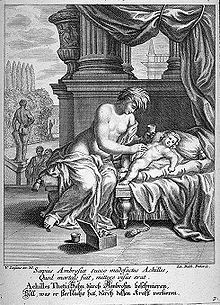 In one version of the story of the birth of Achilles, Thetis anoints the infant with ambrosia and passes the child through the fire to make him immortal—a familiar Phoenician custom—but Peleus, appalled, stops her, leaving only his heel unimmortalised (Argonautica 4.869-879). In the Iliad xvi, Apollo washes the black blood from the corpse of Sarpedon and anoints it with ambrosia, readying it for its dreamlike return to Sarpedon’s native Lycia. Similarly, Thetis anoints the corpse of Patroclus in order to preserve it. Additionally, both ambrosia and nectar are depicted as unguents (xiv. 170; xix. 38). In the Odyssey, Calypso is described as having “spread a table with ambrosia and set it by Hermes, and mixed the rosy-red nectar.” It is ambiguous whether he means the ambrosia itself is rosy-red, or if he is describing a rosy-red nectar Hermes drinks along with the ambrosia. Later, Circe mentions to Odysseus that a flock of doves are the bringers of ambrosia to Olympus. In the Odyssey (ix.345–359), Polyphemus likens the wine given to him by Odysseus to ambrosia and nectar. One of the impieties of Tantalus, according to Pindar, was that he offered to his guests the ambrosia of the Deathless Ones, a theft akin to that of Prometheus, Karl Kerenyi noted (in Heroes of the Greeks). Lykourgos (Lycurgus) of Thrace, an antagonist of Dionysus, forbade the cult of Dionysus, whom he drove from Thrace, and was driven mad by the god. In his fit of insanity he killed his son, whom he mistook for a stock of mature ivy, and Ambrosia, who was transformed into the grapevine. Ichor, blood of the Greek gods, related to ambrosia. Elixir of life, a potion sought by alchemy to produce immortality. Morto nesta sexta-feira (18), o escritor José Saramago (1922-2010) era também um militante “hormonal” do comunismo e dedicado polemista. Entre seus argumentos, o prêmio Nobel de Literatura defendia que a ditadura dos irmãos Castro em Cuba é um dos mais solidários regimes do mundo e que Portugal deveria entregar-se à Espanha para fundar uma nova nação chamada Ibéria. Saramago, que já foi filado ao Partido Comunista Português, se definia também como adepto da democracia. Para ele, a falta de debate sobre esse assunto transformava-a em “uma santa no altar, de quem não se espera milagres” e que existe nos tempos de globalização da economia “apenas como uma referência”. “Não se repara que a democracia em que vivemos é sequestrada, condicionada, amputada”, disse ele durante um debate em Portugal. O escritor dizia-se obrigado a mudar um mundo injusto que encontrou. “O espaço ideológico e político onde eu podia esperar pelo menos alguma coisa que me confirmasse essa idéia era muito claro. Era a esquerda, a esquerda comunista. Aí estou”, resumiu durante sabatina do jornal Folha de S.Paulo, em 2008. Fã de ironias, afirmou na ocasião que a pergunta sobre sua militância de esquerda apesar dos crimes cometidos na União Soviética é “inevitável em qualquer entrevista”. “Poderia perguntar à pessoa se ela era católica. Provavelmente me diria que sim. E eu teria que perguntar, para seguir na mesma linha: ‘Depois da inquisição, como é que você continua a acreditar?’”, afirmou. “Sou aquilo que se podia chamar de um comunista hormonal. Da mesma maneira que tenho no corpo, não sei onde, um hormônio que me faz crescer a barba, há outro hormônio que me obriga, mesmo que eu não quisesse, por uma espécie de fatalidade biológica, a ser comunista. É muito simples”, disse. Apesar de ser um histórico defensor do regime cubano, Saramago ensaiou um rompimento em 2003, quando 75 dissidentes foram presos e três pessoas foram executadas em um julgamento sumário. Em uma carta, escreveu: “De agora em diante Cuba segue seu caminho, eu fico aqui. Cuba perdeu minha confiança e fraudou minhas ilusões”. Pouco depois, em entrevista a um jornal cubano, reatou: “Não rompi com Cuba. Continuo sendo um amigo de Cuba, mas me reservo o direito de dizer o que penso, e dizer quando entendo que devo dizê-lo”. O líder mundial que mereceu as palavras mais duras de Saramago foi o primeiro-ministro italiano, Silvio Berlusconi, a quem apelidou de “vômito”. “Berlusconi corrompe tudo que toca. Não consigo compreender um personagem tão vulgar, tão ridículo, tão patético”, disse o escritor em um debate na Itália. “É ofensivo que uma prostituta vá à televisão oficial. Palavra de Berlusconi. Mas parece que não é ofensivo que uma ou mais prostitutas durmam no palácio do governo com o primeiro-ministro da Itália”, atacou. “Lula está de pés e mãos atados e parece que não vai mais conseguir fazer as grandes medidas que prometeu no plano social. Foi uma decepção para o mundo”, resumiu, para, em 2009, voltar atrás em uma entrevista ao jornal O Globo: “Acho que o presidente Lula tem feito um excelente trabalho neste segundo mandato se aceitarmos como inevitáveis certas ‘infidelidades’ ao seu programa inicial”. Saramago também fez vários comentários sobre Israel que geraram críticas. Afirmou várias vezes que o tratamento de Israel aos palestinos se compara ao dado aos judeus no campo de concentração de Auschwitz, na Polônia, durante a Segunda Guerra Mundial (1939-1945). Mas sua declaração recente mais polêmica diz respeito a seu próprio país: sugeriu que Portugal se permita uma fusão com a Espanha. “Já temos a Andaluzia, a Catalunha, o País Basco, a Galícia, Castilla la Mancha e tínhamos Portugal. Provavelmente [a Espanha] teria de mudar de nome e passar a chamar-se Ibéria. Se Espanha ofende os nossos brios, era uma questão a negociar”, afirmou o escritor em entrevista ao Diário de Notícias, em 2007. “O Ceilão não se chama agora Sri Lanka, muitos países da Ásia mudaram de nome e a União Soviética não passou a Federação Russa?”, completou, em tom de ironia. A maioria dos colegas escritores portugueses protestou. Os jornais locais ganharam páginas e páginas contra a sugestão de Saramago. Outros, notaram no comentário apenas mais uma provocação feita pelo literato. Provocação de um homem hormonal. Ela chegou ao Ocidente como mais um item da lista de atrações exóticas do Oriente. Hoje, está se transformando em um dos mais respeitados recursos terapêuticos usados pela medicina que conhecemos. Está se falando aqui da meditação, uma prática milenar cujo principal objetivo é limpar a mente dos milhares de pensamentos desnecessários que por ela passam a cada minuto, ajudando o indivíduo a se concentrar no momento presente. É por essa razão que um de seus benefícios é o de ajudar as pessoas a lidar com sentimentos como a ansiedade. Mas o que se tem visto, de acordo com as numerosas pesquisas científicas a respeito da técnica, é que a meditação se firma cada vez mais como uma espécie de remédio – acessível e sem efeitos colaterais – indicado para um leque já amplo de enfermidades: da depressão ao controle da dor, da artrite reumatoide aos efeitos colaterais do câncer. A inclusão da prática no rol de tratamentos da medicina ocidental é um fenômeno mundial. Nos Estados Unidos, por exemplo, ela figura entre as opções de centros renomados como o Memorial Sloan-Kettering Cancer Center, um dos centros de referência do planeta no tratamento da doença. Também está disponível na Clínica Mayo, outro respeitado serviço de saúde. No Brasil, o método começa a ganhar espaço, boa parte dele assegurado pela Política de Práticas Integrativas e Complementares do SUS, implementada em 2006 pelo Ministério da Saúde. Ela incentiva o uso, pela rede pública, de uma série de práticas não convencionais – como a medicina tradicional chinesa, a acupuntura e a fitoterapia – para auxiliar no processo de cura. “Nessas diretrizes, a meditação está prevista como parte integrante da medicina chinesa”, explica a médica sanitarista Carmem De Simoni, coordenadora do programa. Em Campinas, no interior de São Paulo, 20 postos de saúde oferecem treinamentos de meditação gratuitos à população. Em São Carlos, também no interior paulista, alguns postos públicos de atendimento começarão a ofertar este ano sessões usando uma técnica conhecida como atenção plena (Mindfulness-Based Stress Reduction, ou MBSR, em inglês), desenvolvida pelo Centro Médico da Universidade de Massachusetts, nos Estados Unidos. É baseada em exercícios de respiração e consciência corporal que ajudam o indivíduo a focar as percepções no momento presente. “Queremos incluir a prática em 30 unidades de saúde”, diz Marcelo Demarzo, chefe do Departamento de Medicina da Universidade Federal de São Carlos. Outra experiência interessante no Brasil é o uso do método em escolas da rede estadual do ensino médio do Rio de Janeiro. Trata-se de uma iniciativa da Fundação David Lynch, criada pelo cineasta americano, com o objetivo de reduzir a violência nos colégios por meio da prática. Um projeto piloto com cerca de 750 crianças e adolescentes de 10 a 18 anos mostrou que ela contribui para o aumento da concentração e da criatividade. “Muitas relataram ainda benefícios como redução de crises de dor de cabeça”, diz Joan Roura, representante da entidade no Brasil. O Hospital Albert Einstein, em São Paulo, decidiu oferecer a prática tanto para pacientes quanto para funcionários, depois de testá-la por dois anos no setor de oncologia. “Nos pacientes em tratamento contra o câncer, notamos uma diminuição na ansiedade e maior disposição para enfrentar a doença”, afirma o médico Paulo de Tarso Lima. Ele é responsável pelo serviço de medicina integrativa no hospital, que promove a adoção de terapias complementares – entre elas, a meditação – para auxiliar no tratamento convencional. O movimento que se observa atualmente com a meditação é o mesmo experimentado pela acupuntura cerca de dez anos atrás. Da mesma forma que o método das agulhas, ela conquista o respeito da medicina tradicional porque tem passado nas provas de eficácia realizadas de acordo com a ciência ocidental. Isso quer dizer que, aos olhos dos pesquisadores, foi despida de qualquer caráter esotérico, mostrando-se, ao contrário, um recurso possível a todos – ninguém precisa ser guru indiano para praticá-lo – e de fato capaz de promover no organismo mudanças fisiológicas importantes. Na publicação “Psychological Science”, há outro trabalho interessante. Pesquisadores da Universidade George Mason constataram que a prática proporciona uma melhora significativa na memória visual. Normalmente, uma imagem é armazenada integralmente no cérebro por pouquíssimo tempo. Mas o estudo verificou que monges, habituados a meditar todos os dias, conseguem guardá-las – com riqueza de detalhes – até 30 minutos depois de praticar. “Isso significa que a meditação melhora muito este tipo de memória, mesmo após um certo período”, disse à ISTOÉ Maria Kozhenikov, autora do experimento. Essa habilidade transforma a técnica em um potencial instrumento para complementar o tratamento de doenças que prejudiquem a memória, como o mal de Alzheimer. No Instituto do Cérebro do Hospital Albert Einstein, aqui no Brasil, pela técnica de ressonância magnética foram fotografados os cérebros de 100 voluntários, antes e depois de um retiro de uma semana para práticas diárias. “Na análise de uma primeira amostra, observamos que as áreas ligadas à atenção, como o córtex pré-frontal e o cíngulo anterior, ficaram mais ativadas após o treinamento”, afirma a bióloga Elisa Kozasa, responsável pela pesquisa. As regiões cerebrais eram observadas enquanto os voluntários realizavam testes para medir o quanto estavam atentos. “Houve uma tendência de maior número de acertos e mais velocidade nas respostas após a meditação”, explica a pesquisadora Elisa. Na área da oncologia, há várias evidências científicas de eficácia. Tome-se como exemplo o estudo feito na Universidade de Brasília pelo psiquiatra Juarez Iório Castellar. Ele investiga os efeitos do método em 80 pacientes com histórico de câncer de mama. Castellar pediu às participantes que preenchessem questionários para medir a qualidade de vida. Por meio da coleta de amostras de sangue e saliva antes e depois dos exercícios meditativos, ele também está acompanhando variações hormonais que indicam a situação da doença. “Um dos dados que já verificamos é que a meditação reduziu os efeitos colaterais da quimioterapia, como náuseas, vômitos, insônia e inapetência”, afirma. Outra frente de pesquisas tenta decifrar seu impacto nas doenças mentais. Novamente, as conclusões são bem animadoras. Na Universidade de Exeter, na Inglaterra, o pesquisador Willem Kuyken verificou que o método é uma opção concreta para auxiliar no controle da depressão a longo prazo. Depois de 15 meses comparando a evolução de pacientes que meditavam e tomavam remédios com a apresentada por aqueles que apenas usavam os antidepressivos, o cientista constatou que crises mais sérias ocorreram em 47% dos meditadores, enquanto entre os outros o índice foi de 60%. Na Universidade George Washington, nos Estados Unidos, a técnica provou-se uma aliada no tratamento de crianças com transtorno de hiperatividade e déficit de atenção. “Houve redução de 50% dos sintomas após três meses de prática”, disse à ISTOÉ Sarina Grosswald, coordenadora da pesquisa. Há ainda evidências de benefícios na luta contra transtornos alimentares como bulimia e dependência de drogas. “A meditação relaxa os dependentes e os torna mais fortes para resistir à vontade de consumir drogas”, explicou à ISTOÉ Elias Dakwar, do Instituto de Psiquiatria do Columbia-Presbyterian Medical Center, em Nova York, instituição que passou a usar o método recentemente. O segredo que possibilita efeitos dessa magnitude nestes tipos de patologias é o fato de a meditação ensinar o indivíduo a viver o presente, sem antecipar medos e sofrimentos. “E como o ato de pensar é ‘desligado’, a mente transcende seu estado ocupado e experimenta um profundo silêncio”, explica Sarina Grosswald. “O corpo, por sua vez, fica totalmente relaxado.” É este o mecanismo que também explica parte do seu poder contra a dor. “O método ajuda os pacientes a perceberem a dor e a deixá-la ir embora, sem se prender a ela”, disse à ISTOÉ Paula Goolkasian, da Universidade da Carolina do Norte, nos Estados Unidos. Ela faz parte de uma equipe que estuda intensamente a relação entre dor e meditação e é autora de alguns artigos científicos a respeito do tema. Permeando todos esses processos, porém, está a redução do stress proporcionada pelo método – e os benefícios advindos disso. O controle da tensão implica mudanças importantes na química cerebral, entre elas a diminuição da produção do cortisol. Liberado em situações de stress, o hormônio tem consequências danosas. Uma delas é a elevação da pressão arterial. Portanto, quanto menor sua concentração, mais baixas são as chances de hipertensão. E como a meditação diminui o stress, acaba reduzindo, indiretamente, a pressão. Este mecanismo explica por que a técnica contribui para a prevenção de doenças cardiovasculares, como o infarto e o acidente vascular cerebral, causadas, entre outras coisas, por uma pressão arterial acima dos níveis recomendados. Um estudo recente realizado na Universidade de Wisconsin, nos Estados Unidos, deu uma ideia desse potencial. Durante nove anos, os cientistas acompanharam 201 homens e mulheres com média de 59 anos de idade. Parte foi orientada a meditar todos os dias e o restante recebeu recomendação para mudar hábitos. Os meditadores tiveram 47% menos chance de morrer de um problema cardiovascular em comparação com os outros. Com base nesse resultado, o coordenador da pesquisa, Robert Schneider, considera que a descoberta equivale ao encontro de uma nova classe de “remédios” para evitar essas enfermidades. “Nesse caso, a medicação é derivada dos próprios mecanismos de cura do corpo e de sua farmácia interna”, disse à ISTOÉ. A ciência registrou ainda mais um impacto positivo da redução do stress promovida pelo método: o auxílio contra a Aids.A doença caracteriza-se pelo ataque do vírus HIV aos linfócitos CD-4 (células que integram o sistema de defesa do corpo). Por causa disso, o corpo fica mais vulnerável a infecções, podendo sucumbir a elas. Mas é sabido que outro inimigo dos exércitos de defesa é o stress: o hormônio cortisol enfraquece seu funcionamento. Por isso, diminuir a tensão é uma maneira de evitar que isso aconteça. Na Universidade da Califórnia, nos Estados Unidos, os cientistas testaram a força da meditação para controlar o stress em pacientes com Aids e constataram que, também aqui, ela funciona. Eles selecionaram 48 pessoas soropositivas, divididas em dois grupos: um meditou e o outro, não. Após oito semanas, os que a praticaram não apresentavam perda de CD-4, ao contrário dos outros participantes. Isso revela que a meditação reduziu o stress. Dessa maneira, contribuiu para preservar o sistema imunológico dos pacientes, ajudando a retardar o avanço do HIV. Uma das mais intrigantes abordagens de pesquisa é a que estuda a relação entre o método e o envelhecimento precoce. Os pesquisadores começaram a fazer essa associação a partir da certeza do vínculo entre o stress – ele de novo – e a ocorrência de uma deterioração celular acentua da. Partindo desse raciocínio, eles querem saber se a meditação também teria efeito indireto nesse mecanismo, já que atua sobre o stress. Cientistas da Universidade da Califórnia estão investigando se a redução do stress causada pela meditação poderia provocar um efeito benéfico sobre os telômeros – espécie de capa protetora das extremidades dos cromossomos cujo comprimento está associado ao grau de envelhecimento celular. Quanto mais comprido, menor o índice de desgaste. E um dos fatores de desgaste dos telômeros é o stress. Portanto, quanto menos stress, mais preservadas essas estruturas. A experiência bem-sucedida incentivou Bignardi a desenvolver uma pesquisa mais ampla. A instituição acompanha a saúde de 1,5 mil idosos para verificar a relação entre estilo de vida, personalidade, cognição e doenças. A intenção agora é analisar como a prática meditativa interfere nessa equação – inclusive na incidência de doenças neurodegenerativas como o mal de Alzheimer. A médica Edith Horibe, presidente da Academia Brasileira de Medicina Antienvelhecimento, já indica a meditação para seus pacientes. “Sem dúvida, ela permite uma vida mais longa e com saúde”, afirma. “E a técnica não exige mudanças no estilo de vida”, completa Kleber Tani, diretor da seção carioca da Sociedade Internacional de Meditação. A Assembleia Nacional Francesa aprovou nesta terça-feira (17) uma lei chamada LOPPSI II (Lei de Orientação e Programação para a Segurança Interior, em tradução livre). Dentre as propostas dessa lei, que tem como objetivo tornar a França um lugar “mais seguro”, está a possibilidade do governo instalar trojans em computadores para monitorar pessoas. Para ser colocada em prática, a lei necessita passar ainda por exame em mais duas instâncias. O projeto de lei, segundo informações do site britânico “The Register” e da PC World americana, foi aprovada na Assembleia Nacional por 312 votos contra 214 e abrange várias áreas como o combate à pornografia infantil, a pedofilia e a criminalização do roubo de identidades online. A LOPPSI II prevê o aumento de gastos da polícia, através de investimentos em monitoramento de câmeras, aumento de penas para quem roubar identidades na internet, a ampliação do acesso ao banco de dados de DNA da polícia nacional e o possibilidade de grampo em linhas telefônicas e monitoramento de acesso à internet. Outra proposta controversa é a que obriga os provedores a bloquear ou filtrar endereços de internet, que o governo julgue necessário. Em um relatório que analisa a economia dos negócios de pornografia infantil, o jornalista Fabrice Epelboin alega que o filtro de URLs não é eficiente, pois esses conteúdos continuarão sendo compartilhados em redes de compartilhamento ponto a ponto. Entidades de defesa à liberdade na internet, como a Quadrature du Net, alertam que a LOPPSI II “deixa a porta aberta a excessos perigosos e deve ser revista com salvaguardas rigorosas, ou ser completamente rejeitada”. De acordo com um estudo da Federação Francesa de Telecomunicações, citado pelo deputado Lionel Tardy, a filtragem de conteúdo custaria à França cerca de 140 milhões de euros. Deputados da oposição ainda tentaram vetar o bloqueio de URLs e sugeriram que os filtros de internet fossem implantados provisoriamente, para verificar se serão eficazes, porém a maioria governista rejeitou a proposta. O dia 21 de janeiro de 2010 será lembrado como uma data sombria na história da democracia norte-americana e seu declínio. Naquele dia, a Suprema Corte dos EUA determinou que o governo não pode proibir as corporações de fazerem gastos políticos durante as eleições – uma decisão que afeta profundamente a política do governo, tanto interna quanto externa. A decisão anuncia uma tomada ainda maior do sistema político dos EUA por parte do setor corporativo. Para os editores do The New York Times, a decisão “atinge o coração da democracia” ao “abrir caminho para que as corporações usem seus vastos tesouros para dominar as eleições e intimidar as autoridades eleitas a cumprirem suas ordens”. O tribunal ficou dividida, 5 a 4, com os quatro juízes reacionários (equivocadamente chamados de “conservadores”) recebendo o apoio do juiz Anthony M. Kennedy. O juiz chefe John G. Roberts Jr. selecionou um caso que poderia facilmente ter sido resolvido em esferas mais baixas e manobrou o tribunal, usando-o para empurrar uma decisão de amplo alcance que derruba um século de precedentes que restringiam as contribuições corporativas às campanhas federais. Agora os gerentes corporativos podem de fato comprar as eleições diretamente, evitando meios indiretos mais complexos. É bem sabido o fato de que as contribuições corporativas, às vezes reempacotadas de formas complexas, podem influenciar em peso as eleições, direcionando assim a política. O tribunal simplesmente deu muito mais poder ao pequeno setor da população que domina a economia. A “teoria do investimento na política” do economista político Thomas Ferguson faz um prognóstico muito eficaz da política do governo durante longos períodos. A teoria interpreta as eleições como ocasiões nas quais segmentos de poder do setor privado se unem para investir com o objetivo de controlar o Estado. A decisão de 21 de janeiro apenas reforça os meios para minar a democracia em funcionamento. O pano de fundo é esclarecedor. Em seu argumento contrário, o juiz John Paul Stevens reconheceu que “há muito sustentamos que as corporações estão cobertas pela Primeira Emenda” – a garantia constitucional para a liberdade de discurso, que incluiria o apoio aos candidatos políticos. No começo do século 20, teóricos de direito e tribunais implementaram a decisão do tribunal de 1886 de que as corporações – essas “entidades legais coletivistas” – têm os mesmos direitos que as pessoas de carne e osso. Este ataque contra o liberalismo clássico foi duramente condenado por um tipo de conservadores que está desaparecendo. Christopher G. Tiedeman descreveu o princípio como uma “ameaça à liberdade do indivíduo, e à estabilidade dos Estados norte-americanos enquanto governos populares”. Morton Horwitz escreve em sua história legal que o conceito de “pessoa” corporativa evoluiu lado a lado com a mudança de poder dos acionistas para os gerentes, e finalmente para a doutrina de que “os poderes do quadro de diretores (…) são idênticos aos poderes da corporação”. Anos depois os direitos corporativos foram expandidos bem além dessas pessoas, principalmente pelos equivocadamente denominados “acordos de comércio livre”. Por esses acordos, por exemplo, se a General Motors estabelece uma fábrica no México, ela pode pedir para se tratada da mesma forma que as empresas mexicanas (“tratamento nacional”) – bem diferente de um mexicano de carne e osso que busca “tratamento nacional” em Nova York, ou mesmo os direitos humanos mínimos. Há um século, Woodrow Wilson, na época um acadêmico, descreveu uns Estados Unidos em que “grupos comparativamente pequenos de homens”, gerentes corporativos, “exercem o poder e controlam a riqueza e os negócios do país”, tornando-se “rivais do próprio governo”. Na realidade, esses “pequenos grupos” se tornaram cada vez mais os mestres do governo. 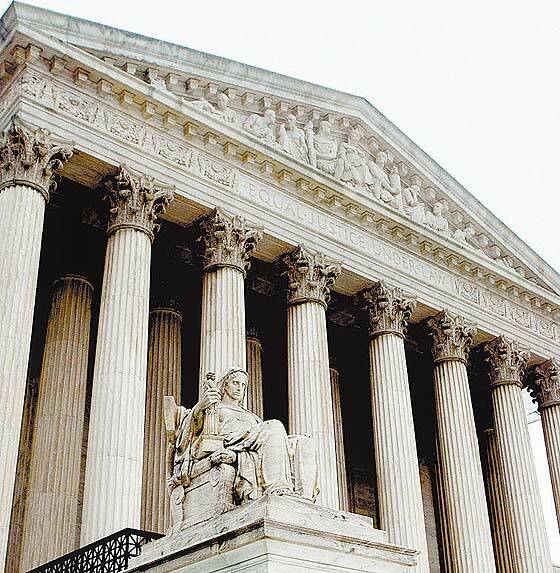 O tribunal de Roberts deu a eles um alcance ainda maior. A decisão de 21 de janeiro veio três dias depois de outra vitória da riqueza e do poder: a eleição do candidato republicano Scott Brown para substituir o finado senador Edward M. Kennedy, o “leão liberal” de Massachusetts. A eleição de Brown foi retratada como uma “virada populista” contra as elites liberais que comandam o governo. Os dados da votação revelam uma história diferente. Altos índices de participação nos subúrbios ricos, e baixos em áreas urbanas em grande parte democratas, ajudaram a eleger Brown. “50% dos eleitores republicanos disseram que estavam ‘muito interessados’ na eleição”. Informou a pesquisa do The Wall Street Journal/NBC, “comparado a 38% dos democratas”. Então os resultados foram de fato uma virada contra as políticas do presidente Obama: para os ricos, ele não estava fazendo o suficiente para deixá-los mais ricos, enquanto que para os setores pobres, ele estava fazendo demais para atingir esse fim. A irritação popular é bastante compreensível, dado que os bancos estão prosperando, graças à ajuda do governo, enquanto o desemprego aumentou para 10%. Nas fábricas, uma em cada seis pessoas está sem trabalho – desemprego nos níveis da Grande Depressão. Com a financialização crescente da economia e o esvaziamento da indústria produtiva, as perspectivas são não trazem esperanças de recuperação dos empregos que foram perdidos. Brown apresentou a si mesmo como o 41º voto contra o sistema de saúde – ou seja, o voto que poderia acabar com a maioria no Senado dos EUA. É verdade que o programa de saúde de Obama foi um fator importante na eleição de Massachusetts. As manchetes estão corretas ao dizer que o público está se voltando contra o programa. Os números da pesquisa explicam porquê: o projeto de lei não vai longe o suficiente. A pesquisa do The Wall Street Journal/NBC descobriu que a maioria dos eleitores desaprova a forma como tanto Obama quanto os Republicanos estão lidando com o sistema de saúde. Esses números se alinham com as recentes pesquisas nacionais. A opção do sistema público foi apoiada por 56% dos entrevistados, e a adesão ao Medicare aos 55 anos por 64%; ambos os programas foram abandonados. Oitenta e cinco por cento acreditam que o governo deveria ter o direito de negociar os preços dos medicamentos, como acontece em outros países; Obama garantiu à indústria farmacêutica que não perseguirá esta opção. Grandes maiorias apoiam o corte de custos, o que faz bastante sentido: os custos per capita dos EUA com a saúde são cerca de duas vezes maiores que os dos países industrializados, e os resultados da saúde são de má qualidade. Mas o corte de custos não pode ser seriamente empreendido enquanto as companhias farmacêuticas são agraciadas, e o sistema de saúde está nas mãos de seguradoras praticamente desreguladas – um sistema caro peculiar aos EUA. A decisão de 21 de janeiro levanta novas barreiras significativas para superar a séria crise do sistema de saúde, ou para lidar com assuntos críticos como as ameaçadoras crises do meio ambiente e da energia. O hiato entre a opinião pública e a política pública cresce cada vez mais. E o prejuízo para a democracia norte-americana dificilmente pode ser superestimado. Goetia ou Ars Goetia refere-se a uma prática que inclui a invocação e evocação de demônios. Baseia-se na lenda judaico-cristã na qual o rei de Israel, Salomão fora agraciado pelos anjos com um sistema que lhe dava poder e controle sobre os principais demônios da Terra e consequentemente a todos os espíritos menores governados por eles. Desta forma, o rei salomão, e posteriormente seus discipulos, teria toda espécie de poderes sobrenaturais, como invisibilidade, sabedoria sobre-humana e visões do passado e futuro. A Arte Goética, (Latin, provavelmente: “A Arte de Uivar”), geralmente chamado simplesmente de Goetia, é a ensinada na primeira parte das Clavículas de Salomão, um grimório doSéculo XVII. Este primeiro capítulo é conhecido como “Lemegeton Clavicula Salomonis” ou “A Chave Menor de Salomão” e nele são descritos todos os 72 Espíritos Infernais assim como todo o sistema que supostamente havia sido usado pelo rei Salomão.